Aalayam - Colors, Cuisines and Cultures Inspired! : It is beginning to look a lot like Christmas! 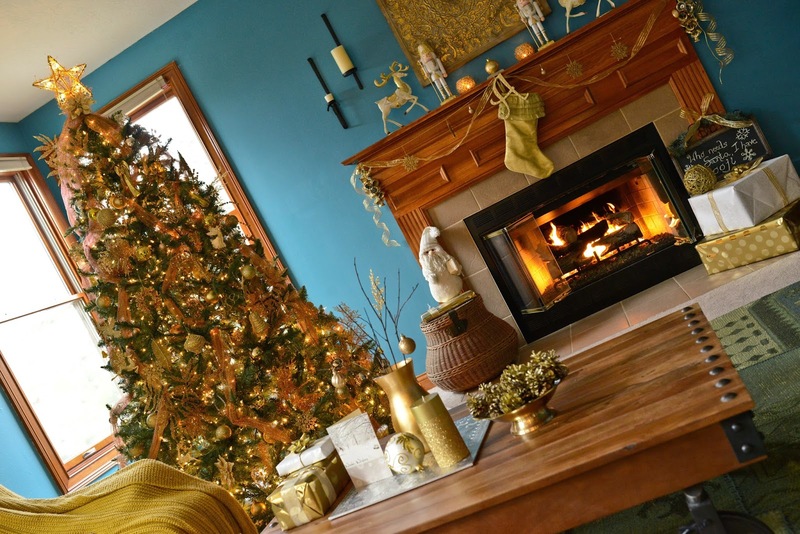 A post on adding a seasonal touch to your home. It is beginning to look a lot like Christmas! 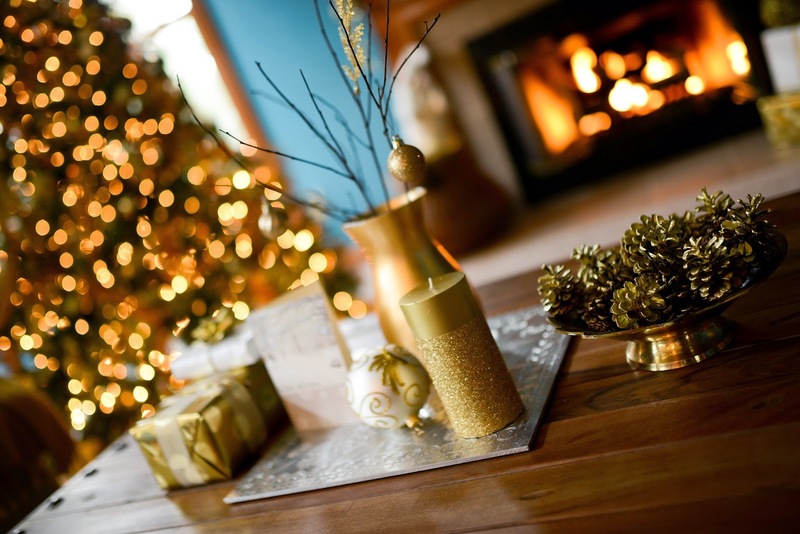 A post on adding a seasonal touch to your home. Welcome to my (Deepa's) Holiday-ready home! Thank you all for joining me here as I take you on a tour of the little holiday touches I've added to the main living area of our house.What better way to usher in the magical spirit of the season than decorate for the Holidays? 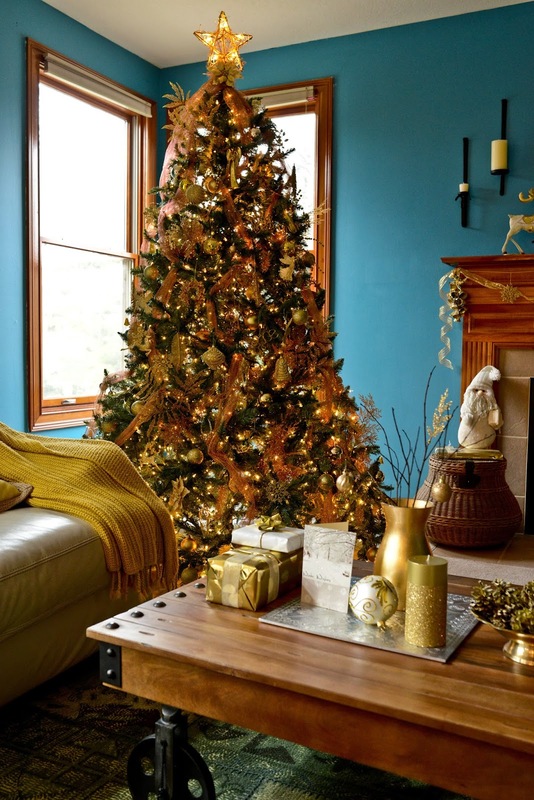 Have you started making your home festive for the season yet? Our tree in all it's golden glory! 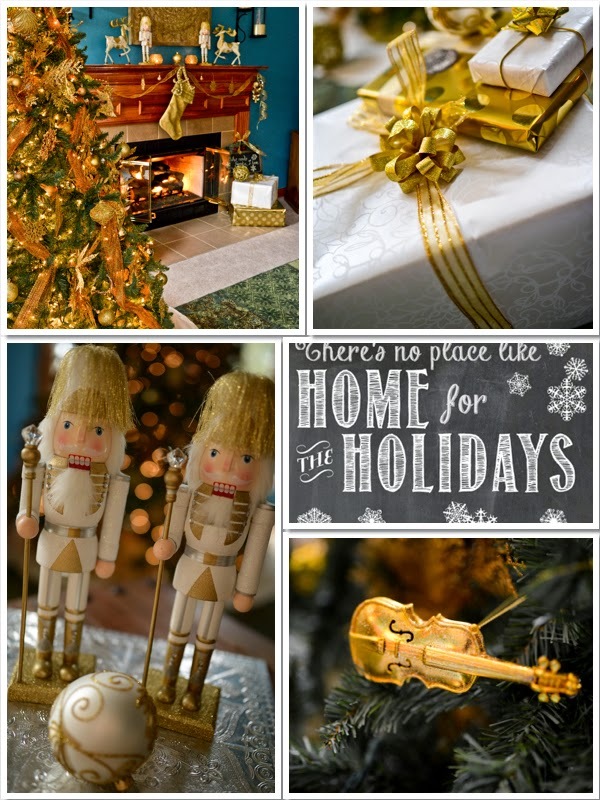 There is an abundance of pin-spiration and holiday eye candy on the Internet. So, all you have to do is yield to your inner creative restlessness and go for it! It is not too late! I used a medley of bows, ribbons and ties in a complementary color palette for the gift wrap this year but the sign tag captures the spirit and steals the show! I started way early this year. I had my family over for thanksgiving and I wanted holiday décor that would help create beautiful memories that we could cherish forever. Twinkly lights and a warm fire - bring it on, winter! So, I sort of fast tracked to Christmas. With my entire family pitching in (love them for their enthusiasm! 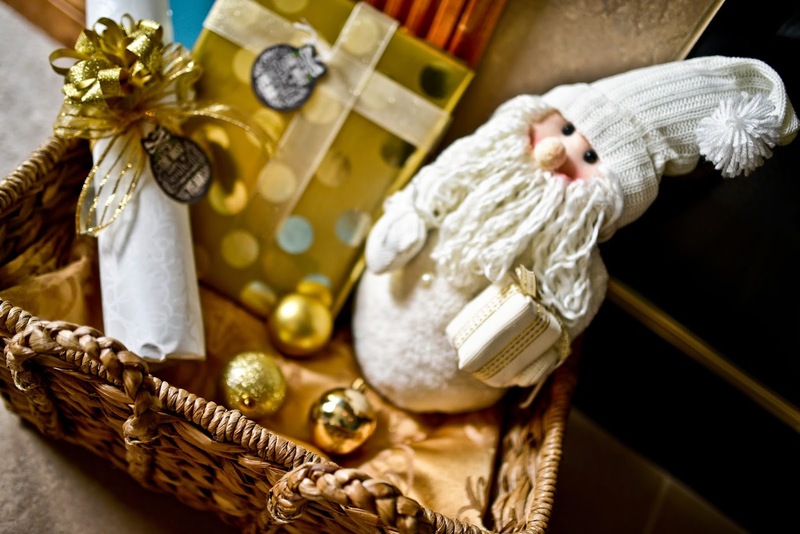 ), outfitting our home for Christmas was in itself a very endearing homespun experience. I think this is my absolute favorite shot from this series. The ornaments this year righfully captures who we are and what we like and allows us to look back on the year that was! 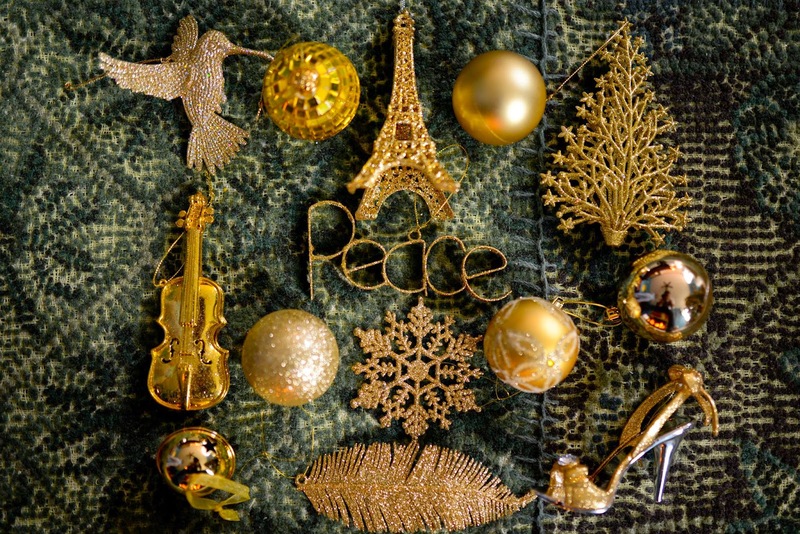 I think our décor this year has a classy elegance and the shimmery gold echoes the cheerful spirit of the season. It seemed like a difficult palette to work with given that I have a formidable blue on the walls but I think with our little personal touches it works and I am curious to know what you all think. I was gunning for magic and excitement – did I nail it or not? 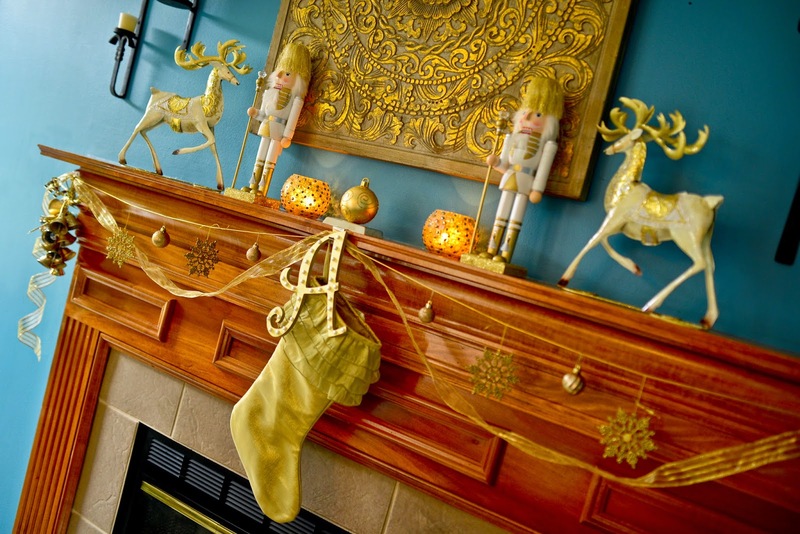 Making sure our existing mantel decor could be tied into the holiday add-ons took some creativity! What sophisticates the gold palette is the intentional splashes of cream in the accent pieces and the gift-wrap and the whole idea was to enhance the existing features of the family room – the hand-woven carpet, the beautiful wood trim on the fireplace and the windows and the color scheme. Aren't they dapper? The latest additions to my growing nutcracker collection! This year, our mantel got a little holiday TLC as well. Perhaps, nothing resonates more with winter’s bewitchery than an intense fire. We spend many cozy evenings by the fire sipping mulled wine, warm cider, ginger chai, hot cocoa and many more seasonal beverages and so I spruced the mantel to set the scene for some cozy winter nights! Mixing in the new with the old and adding some DIY elements was all it took to jazz it up! I had so much fun educating myself on the stocking tradition and history. The monogram on the stocking was a DIY Christmas craft that my li’l elf and I worked on. 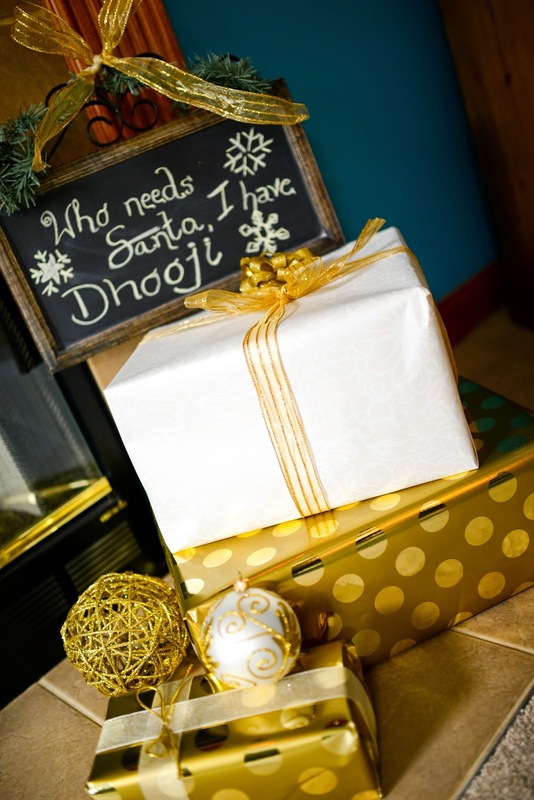 A spray-painted wooden letter A adorned with some pearls was an easy way to personalize the stocking! A lick of spray paint and a few stick on pearls and voila! - we have a custom made monogram! I have adopted and embraced the Christmas/holiday tradition and I am now making a sincere attempt at learning the essence so I can create a true and traditional experience for my child and that for me involves reading, learning and educating myself. 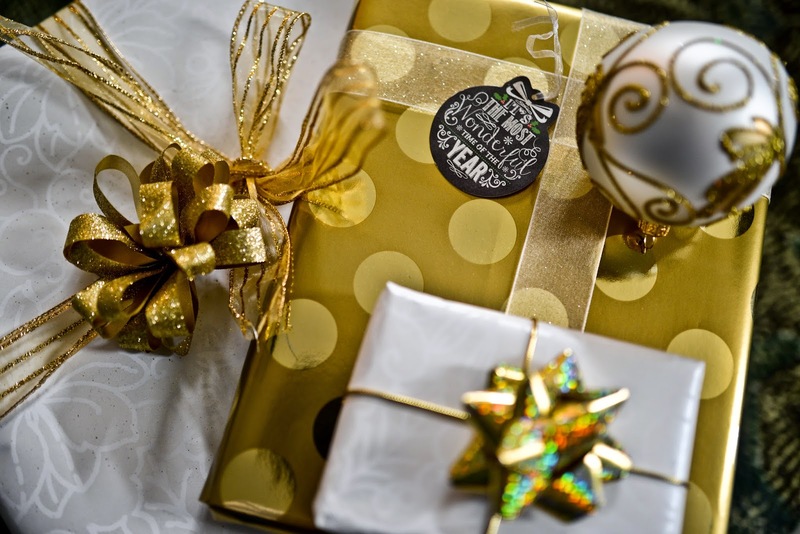 Over the years, we have picked up a few other holiday traditions that are now ours to keep and I talked about them in my holiday post last year. The season is just beginning and I hope to indulge in our favorite seasonal traditions again this year. How about you? Group similar objects (metallic in this case) for a quick vignette. A few spray painted pine cones and twigs from the backyard adds texture and interest. I hope you have enjoyed looking at the festive images from our home and I wish you all a very chic and cheerful Christmas! Hope you get and give all you aspire for this Christmas! And this is how it looks a night! Well, that’s it folks! I am signing off the year. Thank you all from the bottom of my heart for another incredible Aalayam year. I had so much fun putting together the posts this past year! A special shout out to my dear hubby who seems to have mastered stringing the lights (no really, isn't our tree below gorgeous?!) And of course for these beautiful photographs! But wait, we are not done yet! We have one more true blue Aalayam post for 2014. Supriya via her powerhouse writing will bring you some year end thoughts to ponder. Stay tuned! Also, make sure to read our Holiday posts from the past here, here and here. P.S: All images are from my home. Please do not use without permission. Thank you dear K! I hope to look back at these christmas trees someday with fondness! Come back for Aalayam's year end post. Beautiful christmas tree. Very nice decoration. You have a wonderful and marvellous blog with lot of posts relating to decorations, art and crafts. Great blog and i hope as in the name of your blog it gives inspiration to so many people. Thank you DS! Will check it out. Oh, glittery gold! You decorated everything pretty! Loved the night shot! Happy Holidays and yes, couldn't sign off without answering your question, you nailed it very well with blue! See you around. Happy Holidays! Thank you Pinkz passion!.. it is always so hard making anything work with this blue and to think that we were so excited about this color. But I am glad the gold works! Stunning Deepa...everything is glorious,looks like out of pottery barn catalog. Happy holidays!! Oh Nayana! You made my day! I love pottery barn holiday catalog - even read an article about how they style and shoot their trees and the process that goes behind it. Each yr, I eagerly wait for the catalog to come out. This is nowhere close to their perfection but thank you for your kind words! Beautiful Deepa. Admire your creativity Uj'spatience and Ani's interest. you doing it amidst your hectic schedule is admirable. Have a happy festival and a good2015. Thank you! Thank you meera aunty! It is a team work - couldn't do it without their involvement and this time I had extra help and enthusiasm too! Beautiful decor and the pictures are exceptional. 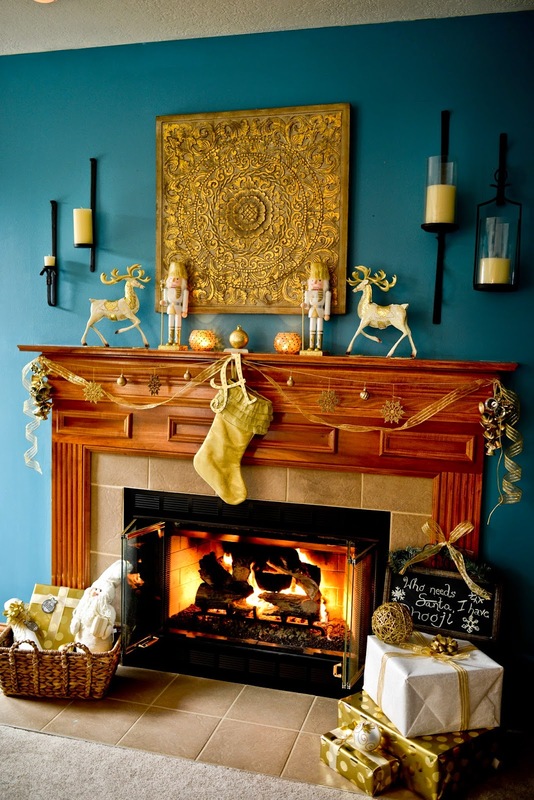 My favorite are the chalk board - 'Who needs Santa' and the gold wall art over the fireplace. Thanks for sharing! Thanks for your wonderful comment! So very creative.. and such a beautiful Christmas.. this is!! Lovely.